Pacific Eden is leaving the P&O Fleet. Her final voyage will depart 16 March 2019 before being transferred to a new operator in April 2019. Pacific Eden opens up Australia for those who want to cruise but don’t necessarily live near one of the major cruising hubs. With cruises departing from ever-popular Sydney, as well as Adelaide, Cairns and Townsville, there is even more opportunity for Australians to get cruising. 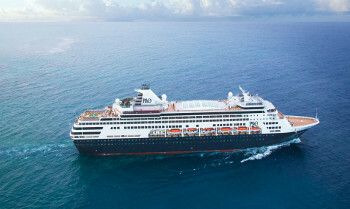 If you’ve never cruised before, or are just looking for a quick break from everyday life, have a look at one of Pacific Eden‘s two to four night Sea Breaks which may take you on a one-way cruise between different ports, cruise you into the ocean and back again, or on the four night voyages, may even enable you to visit another port of call. For a longer exploration of the land down-under, have a look at one of Pacific Eden’s Australia itineraries, of if a South Pacific island escape is what your after, Pacific Eden has a extensive range of island cruises to choose from. View all Pacific Eden cruises, view a selection of P&O Australia cruise deals, or view more options for P&O Australia cruises. Escape to Pacific Eden. Live large in a luxury penthouse suite, dig in with sixteen dining experiences or take a dip in the top deck pool – it’s open no matter the weather thanks to a climate controlled retractable roof. Pacific Eden is our floating oasis. From steaming baskets of dumplings to sizzling plates of spicy stir-fry, Dragon Lady is bringing the heat. With a sultry mix of dark timbers and midnight blue tones, it boasts an intimate and mysterious setting. Be seduced by the exotic scents and spices of a menu inspired by Australians passion for Asian cuisine. Bursting with flavour, every mouthful promises a tantalising night in the Orient. Open every night for dinner, featuring a fixed menu giving guests the opportunity to enjoy a sensual feast of Chinese, Thai, Indian or Japanese. Only available onboard Pacific Aria and Pacific Eden. With over 40 a la carte menu items for breakfast, lunch and dinner, this modern Australian restaurant serves up a sophisticated selection. The Pantry is like nothing you’ve ever seen before. It offers interactive dining with a range of stylish, individual outlets offering a range of contemporary Australian and international cuisine. Exclusive to P&O, Salt grill the first Australian celebrity chef restaurant at sea. You will love this unforgettable dining experience. Chef’s Table is a dinner you’ll never forget. An exclusive and private dining experience hosted by our Executive Chef. The Chef’s Table experience can be booked once onboard. Let our resident DJs help you dance the night away. They know just how to get the party started so make sue you wear the right shoes to burn a hole in the dance floor. Head to the Blue Room for live music all day (and all night) long. With everything from Blues to RnB, jazz and funk, this isn’t your typical cruise music. It’s the perfect venue for a nightcap after one of our brand new production shows or themed parties. Let our resident DJs help you dance the night away. They know just how to get the party started so make sure you wear the right shoes to burn a hole in the dance floor. Get closer to the sun and relax on one of the poolside lounges by our open-air top deck pools. Arguably P&O’s best idea yet, we’ve revamped the adults-only Oasis with hanging chairs, cushioned cabanas and of course, the stunning ship’s wake. Relax, rejuvenate or get poolside fabulous. We have a range of utterly decadent and relaxing therapies at Aqua Spa. Always wanted to know how to make the perfect latte or dance the cha cha? With a range of classes onboard, weÂll teach you to master all sorts of skills!